We recently wrote about the pro-vegetarian ads Mercy For Animals spread throughout busy transit spots in Chicago. 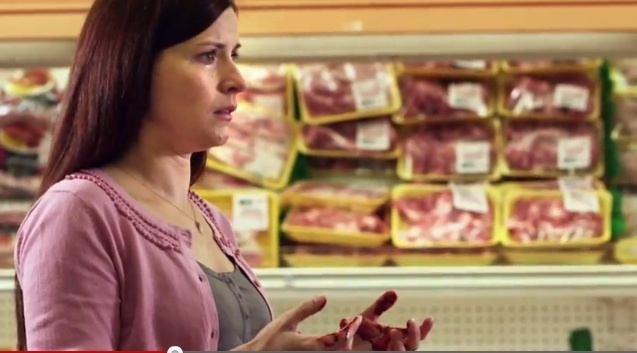 Now, the animal rights organization has unveiled three very powerful television commercials. 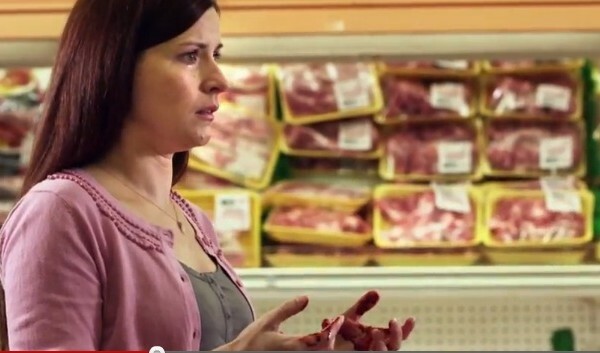 The ads depict a woman buying meat in a grocery store, another at a drive-thru window, and a student in a school cafeteria – all of whom look down to see blood on their hands. This is followed by video of animals in factory farms, and the message “Help end animal cruelty. Choose vegetarian.” If you missed out on the vegan soirée, you can still donate to the ad campaign online or by calling 1-866-632-6446. According to MFA, with a donation of $25 you’ll be enabling them to reach 2,500 viewers! You can watch all three of the new ads in the video below. It would be great, but expensive, if these commercials could air on this year’s Superbowl.